Our October meeting, just before Deepavali, was an interesting one. No flowers, but a workshop on something sweet! 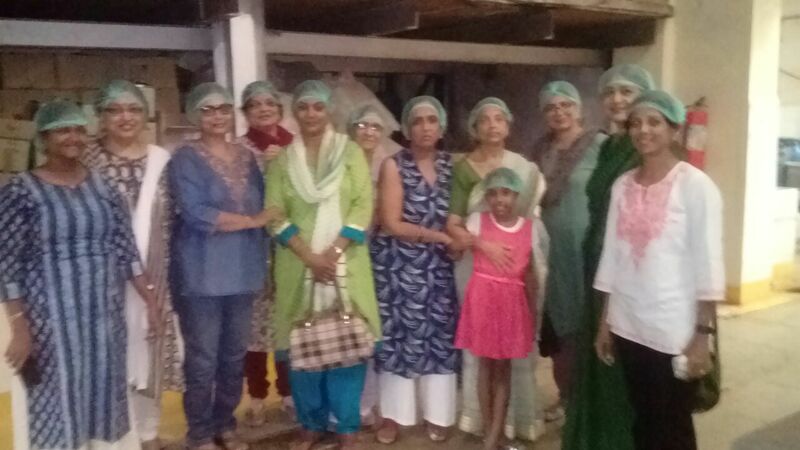 Our member sensei Trishala arranged for us to visit their food factory., Megafoods, in the Ambattur Industrial estate. 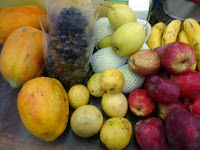 The fruits - papaya, guava, black grapes, apples, bananas and pears - had been bought, washed, cut and pureed, in order to save time. Twelve members were present, (as also young Shivani, who kept us all entertained! ), and after a briefing by Mr Amit Vaishnav on the processes, controls and quality checks required for a food unit, we were taken down to the unit, to see a small batch of mixed fruit jam and eggless mayonnaise be prepared. Members with our hairnet caps! in one of the larger steel cauldrons that lined the room. flavouring that goes into the jam. As the fruit puree bubbled and boiled, we moved to the mixer/grinder where the mayo preparation was beginning. a mix with water, the oil is added in a steady stream as the mixer blends, in order to give the consistency. It is therefore easy to pour and bottle. For larger batches, there is a mechanised bottling line as well. Pepper mayo, bottled and ready for us! And the mixed fruit jam as well! After a sumptuous lunch hosted by our gracious hosts, we returned to the factory, as the members had ordered various other sauces, jams, squashes and pickles to try! It was late afternoon by the time we all departed, a morning well spent! Our sincere thanks to Trishala and Amit for organising this and answering our innumerable questions, patiently! A Happy Deepavali to all! Mr Minagawa and Mrs Lan Minagawa were on a personal visit to Chennai, and the Study Group were happy to meet them over lunch. Friends of Ikebana and the Study Group during their stint at the Chennai Consulate, we have warm and happy memories of them, and it was good to renew our friendship. The afternoon was marked by smiles, laughter and warm exchanges. Friendship through flowers, indeed! An award for Malathi sensei! 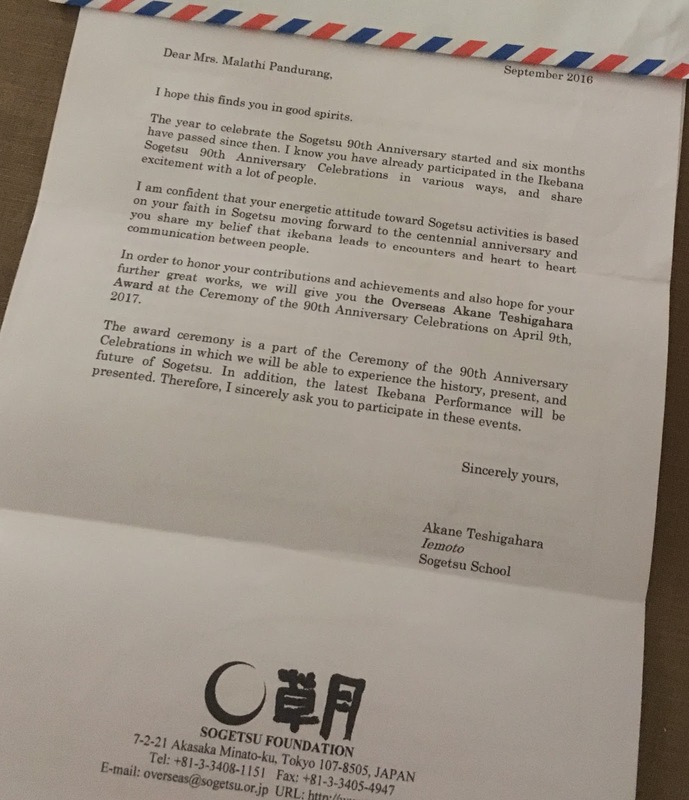 The Chennai Sogetsu Study Group was delighted to learn that our Chairperson Sensei Malathi will be honoured by Iemoto Akane with the Overseas Award, at the Ceremony to coincide with the 90th anniversary celebrations of the school, in April 2017!